For the Game Boy game, see Mega Man II. Mega Man 2, known in Japan as Rockman 2: Dr. Wily no Nazo (ロックマン2 Dr.ワイリーの謎, Rokkuman 2 Dr. Wairī no Nazo?, lit. 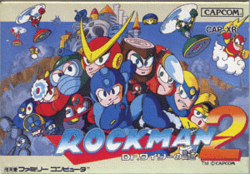 "Rockman 2: The Mystery of Dr. Wily"), is a platform game developed and published by Capcom for the NES. It is the second installment in the original Mega Man series. The game was released in Japan in 1988, and in North America and PAL regions the following years. Mega Man 2 continues the titular protagonist's battle against the evil Dr. Wily and his rogue robots. The game features graphical and gameplay changes from the first Mega Man game, many of which have remained throughout the series. With more than 1.5 million copies sold, the game is the best-selling Mega Man title. Critics praised its audio, visuals and gameplay as an improvement over the first game. Many publications rank Mega Man 2 as the best title in the series, and as one of the greatest video games of all time. The game has been re-released on several consoles and mobile phones. For more details on the plot, see Story. Mega Man 2 takes place after the original Mega Man, which is set in an unspecified year during the 21st century (the year 200X). Dr. Wily, the series' main antagonist, builds a new fortress and army of robotic henchmen, led by eight new Robot Masters of his design: Metal Man, Air Man, Bubble Man, Quick Man, Crash Man, Flash Man, Heat Man, and Wood Man. Mega Man is sent by his creator, Dr. Light, to defeat Dr. Wily and his Robot Masters. Mega Man crushes the eight new Robot Masters and then challenges Wily himself. Mega Man The Wily Wars: The first remake appeared on the Sega Genesis in 1994 and contained the first three games with updated 16-bit graphics, as well as some new material, and was released in Europe and Japan, but not North America. It was then remade for the PlayStation in 1999 as part of the Rockman Complete Works series, which presented the first six games with their original NES graphics, but contained an updated assist mode known as Navi Mode which also contains updated music from the Mega Man arcade games. These remakes were only available in Japan. Mega Man Anniversary Collection: The re-releases continued in 2004 when the anniversary collection was released for the Nintendo GameCube, PlayStation 2, and Xbox. This collection contained the Mega Man games 1 through 8 and featured many of the improvements found in the Complete Works series. Mega Man 2 for the NES was reissued on the Wii Virtual Console service in Europe in 2007 and in North America and Japan in 2008. This page was last edited on 15 August 2016, at 01:45. This page has been accessed 80,502 times.